Money may be considered the single greatest organizational invention of the past five thousand years comparable in its impact to that of language and the Internet. The emergence of money as a pre-eminent social institution vividly illustrates the central role of organization in the process of social development. MSS is engaged in a major research project examining the theoretical and historical foundations for the social institution of money as an application of development theory. The research includes an examination of the underlying social causes of inflation, the factors leading to the onset of the Great Depression, as well as the Japanese and East Asian financial crises. In 2007, the Society began the first draft of a book presenting its theoretical perspective on the nature and role of money in social development. 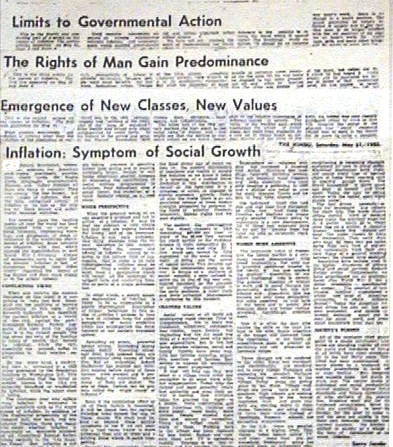 In 1979, the Society undertook a research project to examine the primary causes underlying the high rates of inflation that frequently accompany rapid economic development. The study found that the greater stress on basic human rights and increasing social importance given to the common man indirectly contributed to higher rates of inflation. The results of the study, which were published as a four part article in “The Hindu”(Left) and sent to leading economists around the world, suggest that there is an inverse relationship between the purchasing power of currency and the social value accorded to the common man. Following the sudden collapse of the economies in East Asia, the Society embarked on a research project to investigate the causes of the crisis and to formulate possible remedies. The Society attended the Conference of the Pacific Rim Economics Associations in Bangkok in 1998 to exchange views and present its recommendations. An article summarizing our approach was published by The Hindu. Further research is in process on the origins, cause and remedy for the Japanese financial crisis that began in 1988 and still impeded growth of the Japanese economy. In 1999, MSS conducted a study of the financial crisis brought on in Japan during the decade following the collapse of real estate and stock market prices after Central Bank action in 1988 which resulted in losses by Japanese banks estimated at $500 billion. In January 2000, MSS researchers submitted proposals to Japanese commercial and Central Bank officials on strategies to end the crisis, reverse the losses and recover a major portion of the write-offs. MSS is presently engaged in preparation of a book examining money as a social organization from the perspective of social development theory. The central thesis of this study is that money, like other social institutions, undergoes a continuous process of evolution reflecting changes in social consciousness, values, attitudes and organization. Each stage in the evolution of money has enhanced its capacity to convert social potentials into social power, thereby contributing to the economic development of society, rising levels of productivity, efficiency and prosperity. In addition, money serves as a symbol for human aspirations and a vehicle for releasing higher intensities of social and individual energy for higher levels of human accomplishment. In 2007 & 2008, the Society conducted research on the subprime mortgage crisis in the USA and on the international financial crisis which resulted from it. Our research focuses on the essential need for greater international financial regulation to control the explosive growth of global financial assets and the case for creation of a global central bank and world currency as an ultimate solution to the problem. MSS organized and chaired a session on this topic at the General Assembly of the World Academy of Art & Science in Hyderabad in October 2008. The Society is also preparing the first draft of a book presenting its theoretical perspective on the nature and role of money in social development.